Here is a homebrew project to help you reach new levels of excellence in ham radio. There probably isn’t a ham who doesn’t get irked by the silly ham expressions (SHEs) heard on the air. One of my least favorites is “Best 73s.” It always reminds me of the man who answers the phone, “Department of Redundancy Department.” Think about it. That’s two bests and two regards. One of our group, Dave Dowler, KA6BFB, created a solution — the Getoutometer shown in Figure 1. Its cleverness goes right to the philosophic heart of all SHEs by taking on my own least liked SHE. Build a Getoutometer (pronounced ge-tou-tometer, not get-out-o-meter) for yourself and see if doesn’t make you feel better. If not, take two surface mount chips and call me on 40 meters in the morning. Technically, the Getoutometer must be built from junk box parts. I especially dislike ham articles that do this, but in this one case I’ll make an exception. I think you will be able to figure out why. What is a Getoutometer? Electronically it is a sophisticated circuit that employs nonlinear differential retroencabulation to ambiguously evaluate your antenna — on the air. The unique IC employs adaptive cross-coupled error correction. And where do you get one? I already told you — from your junk box. The circuit is shown schematically in Figure 2. The antenna you want to evaluate connects via a low conductivity USB 2.0 connector to R3, a thin skin resistor. This resistor may be omitted if you are not highly sensitive to snickering on the air. Next, IC2A limits all ego from Getoutometer readings. The heart of the Getoutometer is IC1, an ambiguity processor. Its highly adaptive retroencabulation PLL prevents scientific readings. C2, an electromagnetic flux capacitor, employing conductive nickel cadmium dielectric, feeds the output signal, now free of all quantitative data, to a cascade base follower configuration. The enable input is further provided with a hyperbole inverter. For even though the Getoutometer eliminates all meaningful comments on your antenna, it is just good ham practice and courtesy for you to maintain at least an image of humility. Power for the Getoutometer is provided from a nonpolarized battery. This helps insure complete isolation from factual input. 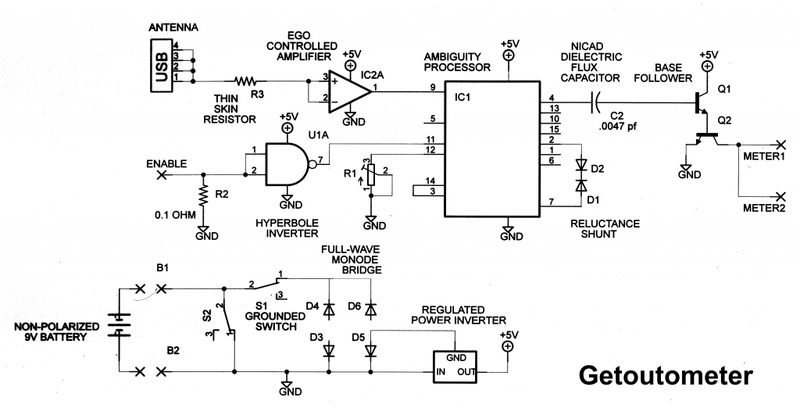 The output of the full wave monode or uniode bridge is then inverted by an LM-9805 inverting regulator, IC3. 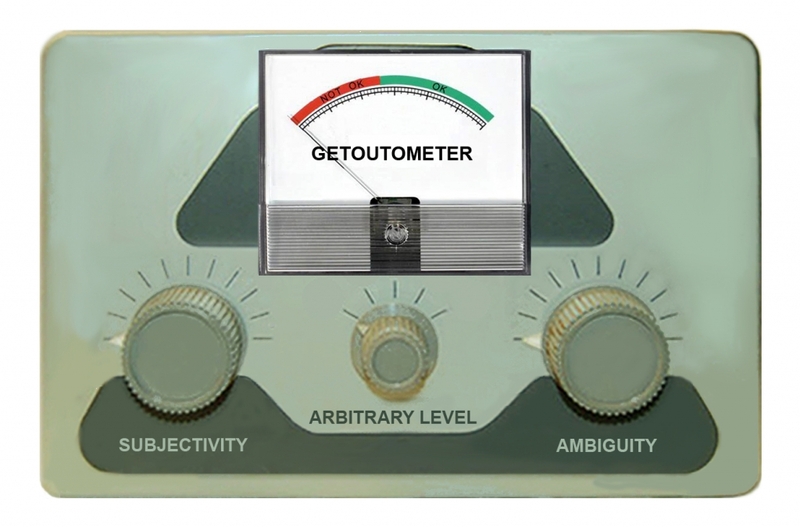 The Getoutometer is not science; it’s purposefully ambiguous. That’s the key — you can’t pin it down. Accurate measurements are irrelevant when you are extolling your favorite antenna. All you mean is that you have made just one contact, no matter how poor your signal report was, how short the distance was, or what power either of you was running. Don’t ever make the mistake of thinking that getting out okay means getting out well. That’s science. Getoutometer readings are ambiguous — by definition. Only four managed to do it, but NA1SS’ QSLs now proudly hang on our shack walls. The best-effort award, though, goes to everybody’s favorite ham uncle in our group, Ernie Sloan, W6ND. We know him as No Donuts. Ernie could not resist my ISS challenge. He put on his Oklahoma engineering cap and came up with a thing of beauty, a maximum ugly homebrew version of the very antenna I was criticizing, made from scrap wire, a wooden stick and some tie wraps (see Figure 3). Everyone immediately dubbed his creation “The Diskluge.” It was in fact a discone that I had disparaged. Amazingly, Ernie did actually make contact with the ISS on his diskluge. He’s also is the only challenger to claim his free breakfast and he definitely enjoyed loudly “sticking it to me” over bacon and eggs. Little did I realize, though, that Dave, KA6BFB, was busily working behind the scenes. The Getoutometer is now a reality. So first locate the ARBITRARY LEVEL control and then make contact with a station. Insure it’s one who tells you, “I can just barely copy you over the noise.” Now adjust the ARBITRARY LEVEL control until the Getoutometer reads OKAY. From there on you will have proof that your antenna gets out okay. No one can ever refute you. This is why a Getoutometer is the best station accessory of all time. 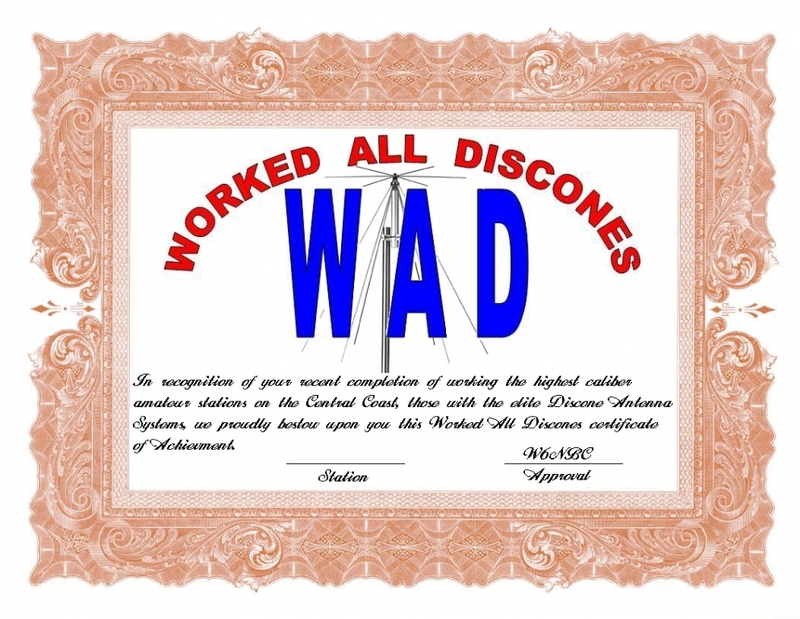 As a parting shot, Dave also created a new award certificate, the WAD — Worked All Discones (see Figure 4). There aren’t any contest rules — it’s arbitrary, like the Getoutometer. But if you’d like, send us some ambiguous QSLs and we’ll make a totally subjective decision to not send you a certificate. We’d enjoy it if readers would send us their favorite “I hate that ham expression.” Who knows? Maybe this will inspire another article. SHEs are all around us, after all. All photos by John Portune, W6NBC. John Portune, W6NBC, an ARRL member, received a BSc in physics from Oregon State University in 1960, his FCC Commercial General Radiotelephone license in 1961 and his Advanced class amateur license in 1965, upgrading to Extra Class in 1985. 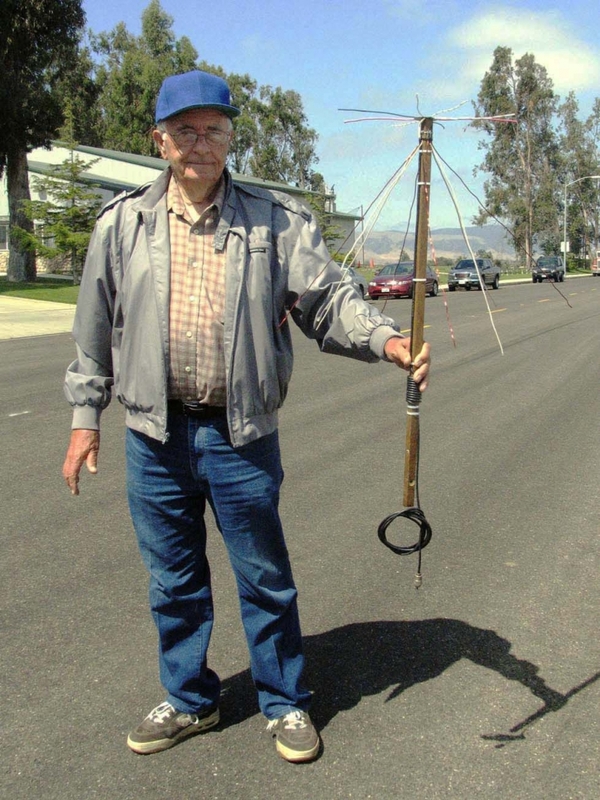 John is active on many bands and modes, predominantly from his HF equipped RV mobile station. He has written various articles in ham radio and popular electronics magazines and remains active as a VE team leader, ham license teacher and website designer. You may contact him at 1095 W McCoy Ln #99, Santa Maria, CA 93455.